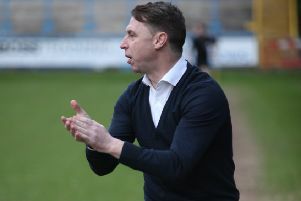 Town boss Jamie Fullarton said it was difficult to ask for more from his players after their impressive performance in the 0-0 draw against Salford at The Shay. The Shaymen were the superior side against promotion-chasing Salford, producing a dominant first-half display before the game evened out a bit more after the interval. It is Halifax’s 14 draw in 30 league games this season, but their third clean sheet in their last five matches, while they have only lost twice in 10 outings against the top seven sides in the league. “In particular in the first-half, there was only one team that looked like they were going to win the game. “I thought ball retention, defensive shape, reaction to things was excellent all round. “If you put it into context, they’re vying for automatic promotion and have made huge investment on and off the field. “But I thought, not just today, but over a period of time, we’ve shown a level of performance that is reflecting in the group of players. “We’re getting competition for places now. “We started the season very well and then were hampered and hurt with injuries and suspensions. “But we have healthy competition for places and it’s no coincidence that performances are at the level they are. “So there’s lots of positives and it was pleasing. Town’s first-half display was arguably their best since their FA Cup clash against AFC Wimbledon on December 1, with The Shaymen, like at Barrow the previous Saturday, justifiably feeling hard done-by not to win. “We’re looking for consistent outcomes, but to have that you need performances of the level,” Fullarton said. “As a group, every day I work with them. It’s not just today but it’s been over a period of time where they’ve demonstrated that. “When you have a performance like that against a team vying for automatic promotion and that are so high profile, then when you analyse the game, it’s very difficult to ask for more. “Whether you look at their attitude and application, their ball retention, their movement off the ball, their defensive shape, chances being created - I’m ticking a lot of boxes there. Town had an appeal for a penalty turned down when a foul on Matty Kosylo was adjudged to have taken place just outside the area. “It’s difficult to say,” Fullarton said when asked if he thought it was a penalty. “It was a foul, because he gave it very quickly, so he’s seen that. “The angle the referee’s at, it’s difficult for him, because he’s at the opposite side to see whether he’s inside or not. “I’ll have to look at it again. “But I think that was indicative of how we played. “I don’t like to be seen as ‘good old Halifax, having a go’. We were better than that today. We showed a composure and and assurance in everything we did, and an understanding and belief. “You can’t pretend to believe in that. “I thought it was similar in that respect to the week before, and the week before that. “So that’s pleasing, because if you have a consistent performance level, and we do the simple things well, then it gives you the best platform to progress and improve. Loan striker Scott Quigley is still yet to score for Town after five matches, but Fullarton was pleased with the forward’s display. “I don’t like the word patience, because I’m not patient,” Fullarton said. “But he’s contributing in other aspects and understanding what we’re doing. “It’s (about) gaining consistent opportunities for him to look to get that goal, because once that goal goes in, then that’s what happens. “There’s no logic to it. Scoring goals and being a goalscorer are two different things. Jacob Hanson, Josh Staunton, Ryan Sellers and Sanmi Odelusi all missed out on inclusion in the squad. “The point of having a group of players to generate healthy competition, which drives players on to perform at a level,” Fullarton said when asked if those players would have to be patient for their chance. “We’re in a good position in certain areas, where we have real competition, with players having different strengths and attributes, which allows me to pick a team to exploit the opposition’s weaknesses and negate their strengths. “That’s what we’ve been looking to do. If you look at performances when we’ve had options to change the team based on the opposition, then the results and performances have shown that the players have applied their strengths to add to what we’re trying to do. “That’s a good position to be in as we move forward, for me to have that healthy competition in all 11 places. “That’s what we get close to when we have people fit and gives me the opportunity to make selections, as opposed to times when we’ve had 13 players fit.